Oneida's Sant' Andrea Botticelli China Dinnerware has a dramatic, steep leaf embossing with hand-carved textures creating an impressive showcase for food presentations. Designed by award-winning European design team Queensbury-Hunt, Botticelli appeals to both casual and fine dining settings. Its bright white, high fire porcelain body comes with a limited 3-year no-chip warranty. Your tabletop is the foundation for a great meal. So you'll want your presentation to be as fresh and unique as the food you are serving. 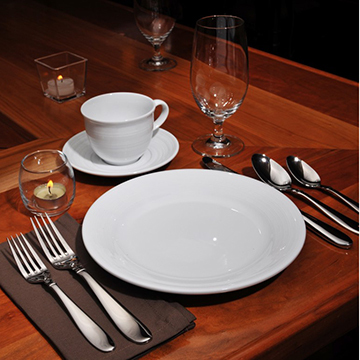 Whether you are a five-star luxury hotel or a comfortable eatery, your customers deserve a perfect dining experience. With Oneida's more than 100 years of experience, you can count on them for unparalleled quality, service & knowledge in the food service industry.